Здесь вы можете прочитать биографию Виктора Цоя на английском языке. Viktor Tsoi/Tsoy (21.06.1962 - 15.08.1990) - Soviet rock musician. Viktor Robertovich Tsoi/ Tsoy was a famous Soviet artist and leader of the rock group Kino. Tsoi was born to a Korean father and Russian mother on June 21, 1962 in Leningrad, USSR (now St. Petersburg, Russia). Tsoi's mother, Valentina Vasilyevna, was a teacher and his father, Robert Maximovich, was an engineer. Tsoi's Korean family name is usually transcribed in English as Choi or Choe. He married Marianna Tsoi in 1985 and had a son with her--Alexander (Sasha). He is regarded as one of the pioneers of Russian rock and has a huge following in the countries of the former Soviet Union even today, as of 2007. Few musicians in the history of Russian music have been more popular or have had more impact on their genre than Victor Tsoi and his rock band Kino. Any discussion of Kino must inevitably begin and end with the creator, writer and lead singer of the band, a man who was once called the "last hero of Russian rock" and a "legend". The band was born when he was, lived when he did, and died with him in a tragic accident. The life of Victor Tsoi is the life of Kino. Unfortunately, after contributing a plethora of musical and artistic works, including ten albums, he died in a car accident on August 15, 1990. 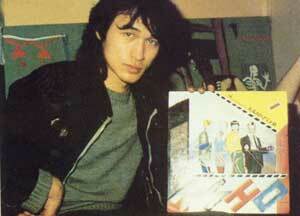 Victor Tsoi was born in Leningrad in 1962. He began writing songs at the age of 17. His early songs discussed themes like life on the streets of Leningrad, love and hanging out with friends. Many heroes in his songs were young men with limited opportunities trying to survive in a tough world. During this time, rock was an underground movement limited to mostly Leningrad; Moscow pop stars ruled the charts and received the most exposure from the media. The Soviet government gave grants to artists who they liked, they provided them with housing, recording studios and anything else they may have needed to succeed. Unfortunately rock music was not too popular with the government. Thus rock bands received little or no funding, they were not given any exposure by the state-run media and was given the stereotype as the music listened by drug addicts and hoodlums. In 1974, Victor Tsoi went to the Serov Artistic Academy, but was expelled from there at the age of 18. The reason for the expulsion was "poor grades", however it didn't help that he was involved heavily in the rock music scene. By this time Tsoi had began to perform the songs he wrote at parties. During one of these performances he was noticed by Boris Grebenshchikov, a member of the established rock group "Aquarium". Grebenshikov took Tsoi under his wing and helped him start up his own band. This signaled the beginning of Tsoi's rock music career. Leningrad's Rock Club was one of the few public places where rock bands were allowed to perform. It was here in 1982, at their first annual Rock Concert that Victor Tsoi made his stage debut. He was playing as a solo artist supported by two "Aquarium" members. Tsoi's innovative lyrics and music impressed the crowd. Before making it big, Tsoi said that the problem with music was that no one wanted to take chances. He wanted to experiment with lyrics and music in order to create something fresh that no one had ever heard before. Tsoi succeeded in his goal. Shortly after the concert he recruited other musicians and they formed "Kino", which in Russian means "cinema". They recorded a demo tape at Tsoi's apartment. This tape was quickly passed around Leningrad, then all over the country by rock enthusiasts. Kino was beginning to gain a following. In 1982, Kino released their first album titled "45". This album first showed Tsoi's willingness to approach political topics in his music, something not too many other artists were willing to do. In his song Suburban Electric Train he discussed a man stuck in a train that was taking him where he didn't wish to go; this was clearly a metaphor for life in the Soviet Union, and the band was quickly banned from performing this song live. Regardless, the political message of the song made it popular among the youth of the anti-establishment movement that now began to look to Victor Tsoi and "Kino" as their idols. 1982 was also an important year because it was when he met Marina, whom he would eventually marry in 1985. She was a source of support and family for Tsoi, giving birth to their son Alexander (Sasha) on Aug. 26, 1985. "Kino" displayed more of their political views at the 2nd Leningrad Rock Club Concert. The band won first place in the competition thanks to Tsoi's anti-war song I Declare My Home ... (a nuclear-free zone). The song's popularity was fuelled by the ongoing Afghan War which was claiming the lives of thousands of young Soviet citizens. "Kino" was still not getting much mainstream attention due to the lack of government support, that would all change with the arrival of Mikhail Gorbachev. Gorbachev came to power in 1985. His social and economic reforms, Glasnost and Perestroika, began exposing the social and economic problems of the Soviet Union and allowed open discussion of them in the media. People were beginning to realize that the Communist experiment was not working out and that things needed to change. Glasnost loosened the restrictions on the media and allowed rock bands to be written about and shown on television. In 1986 Tsoi used the open atmosphere and public sentiment to release a song titled [We're waiting for] Changes!. The song called on the young generation to demand changes within the current system and spread "Kino"'s name all over the nation. However, in an interview, aired on soviet TV shortly after his death, Tsoi claims that his songs often have been misinterpreted in the public and that he usually avoids political intentions in his poetry. In particular, Changes!, which was used widely for the perestroika movements, has nothing to do with it, he said. 1987 was a breakthrough year for "Kino". The release of their 7th album Blood Type (Russian: Группа крови/Gruppa Krovi) triggered what was then called "Kinomania". The open political climate under Glasnost allowed Tsoi to make Blood Type his most political album yet it also allowed him to record a sound of music that no one before him was able to play. Most of the tracks on the album were directed at the youth of the Soviet Union, telling them to take control and make changes within the nation, some of the songs discussed the social problems crippling the nation. The sound and lyrics of the album made Tsoi a hero among Russia's youth and "Kino" the most popular rock band ever. Over the next few years Tsoi appeared in several successful movies and also traveled to the USA to promote his films at film festivals. Several more albums were released, their themes were once again mostly political, further fueling the band's popularity. Even though Tsoi was a huge star, he still lived a relatively normal life. He kept his old job in the boiler room of an apartment building, this surprised many people. Tsoi said that he enjoyed the work and he also needed the money to support the band, as they still received no government support and their albums were copied and passed around the nation free of charge. This made Tsoi even more popular among the people because it showed that he was down to earth and they could relate to them. "Kino"'s finest hour came in 1990 with a concert at Moscow's Luzhniki Stadium. 62,000 fans filled the stands to celebrate the triumph of Russia's most successful rock group. While in Latvia, on 14 August 1990, Tsoi finished recording the vocals for Kino's next album. He was supposed to travel back to Leningrad so that his band mates could record its musical score. Early in the morning of August 15th, Victor Tsoi was killed when he lost control of his car and slammed into a bus outside of Riga. The car was completely demolished to the point that one of its tires was never found. This all happend on the way back from a fishing trip. Tsoi actually wanted to take his son, Alexander (Sasha) with him on the trip, but fortunately, Sasha did not go.